If you looked out the window yesterday, you may have thought that Sunday's Bank of America Shamrock Shuffle would be a repeat of last year's race affectionately labeled the "snow shuffle" when a wintry mix fell across the city in the hours before the race start. With the snow falling all day yesterday, all you could do was pray that the skies dried out and the only challenge to race day was colder temperatures than what arrived midweek. Whether or not Chicago runners got in the running mood thanks to that break in winter temperatures a few days ago, they came out to run the race regardless of conditions. It was a record-breaking day for the race, which saw more than 25,000 runners cross the finish line out of a registered 36,000 participants. 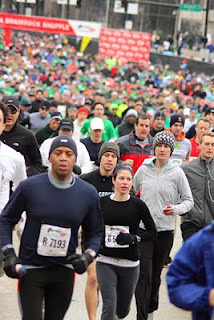 In 2009, the Shamrock Shuffle only had 13,714 finishers, with many (including myself) opting to bail when the weather soured. Unfortunately for me, I can't say I was one of the 25,561 finishers in a race that usually kicks off my running season...the calendar made for two area favorites to have the same race start and I was out in Cary, Ill., at the March Madness Half Marathon instead (check for a race report soon). Had I realized the events had the same date when I signed up, I may have selected the Shamrock 8K over the 13.1 miles, but that's another story--and kinda makes me sound like a running wimp. But cold weather was not stopping the runners this morning who dealt with the 35-degree weather like it was another wintry training day and weren't phased by the typical-to-Chicago winds. They came out in full force on the streets of Chicago and turned in some fast times. John Kemboi of Kenya crossed the finish line first in 23:39, while Tera Moody finished first for the women in 27:21. This was Kemboi's first race in the U.S., while Moody--who grew up in St. Charles and now lives and trains in Colorado Springs--returned atop the podium after winning the 2007 in 27:09. Rounding out the top five for the men were Matt Hooley (Madison, Wis.) in 23:44, Tyler Sigl (Seymour, Wis.) in 23:46, Kaleb Vanort (Mishawaka, Ind.) in 23:50, and Ryan Bak (St. Louis, Mo.) in 23:55. For the women, the top five included Erin Moeller (Mt. Vernon, Ind.) in 27:51, Sara Slattery (Phoenix, Ariz.) in 28:00, Claudia Becque (Chicago, Ill.) in 28:10, and Jenna Mitchler (Appleton, Wis.) in 28:20.